Cocktails for brunch? Yes, please! Serve bright and light cocktail recipes to jazz up your morning spread or mum’s special breakfast in bed. Fruits and champagne are a good start for morning or midday drinks, but you can also mix it up with a dash of gin, rum, or vodka. Spiked coffee will even be perfect for those stormy days. Just keep your cocktail recipes light and no one should be raising an eyebrow at that daytime glass. Place the peach and peach schnapps into the Vitamix container and secure the lid. Select variable 1. Turn the machine on and slowly increase the speed to variable 10. If using a different blender, choose the corresponding speed option. 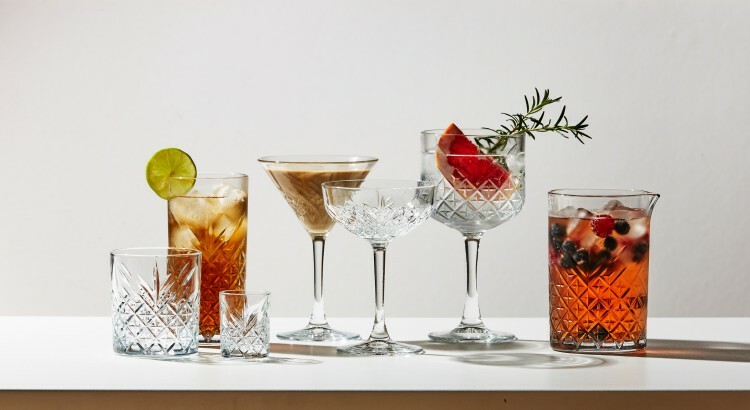 Chill your cocktail glasses prior to serving. Add ice to each glass. Cut your grapefruit into segments. Squeeze the juice out from the remaining membrane with your hand and divide it between glasses. Add grapefruit slices, juniper berries, and a rosemary sprig to each glass. Pour 60ml gin into each glass. Add the cordial and tonic then stir before drinking. Grind your coffee beans using a coffee grinder like the KitchenAid Artisan Coffee Grinder. Brew the freshly ground beans in a coffee maker like the KitchenAid Siphon Coffee Brewer. Combine the coffee, whiskey, and sugar in a coffee mug, and stir until the sugar has dissolved. Top with whipped cream, ground nutmeg or chocolate shavings, if desired. Serve immediately. Place mint leaves, lychees, limes, and sugar in a pestle and mortar. Crush them to release their fragrant oils and flavour. Divide the mixture between two cocktail glasses. Place three to four ice cubes in each glass. Pour 30ml rum into each glass. Top with soda and add a straw to stir. Decorate with an extra slice of lime or lychee. Make the sugar syrup by dissolving the sugar and water in a small saucepan. Allow this to cool afterwards. Muddle the raspberries and strawberries in a large cocktail glass. Add the sugar syrup, a dash of vanilla vodka. Top up with champagne.